Praa Sands beach in the 1950's. Guest photos by Steve and Karen, 2016. It is always a pleasure to come to this lovely house with its wonderful view. We love it and hope to come again soon. Ingo and family, Germany, August 2018. We had a wonderful week in your house. Especially the great views and Sandy beach we enjoyed the most. 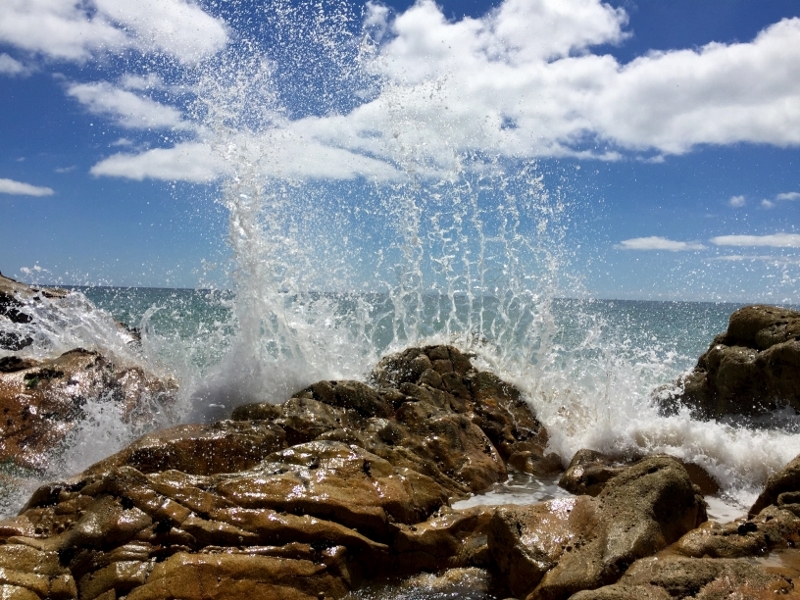 The coastal path gave us a great way to enjoy beautiful Cornwall. Thanks for everything. Klaus and family, Germany, Airbnb, August 2018. A wonderful house with the best view and you hear the sea when you lay in bed. Everything you need is there! Jennifer B and family, Germany, Owners Direct, August 2018. We spent two lovely weeks here in this amazing house. We enjoyed every minute and what we will miss the most are the breathtaking views. Family Hofner, Switzerland, July-August 2018. Fantastic house in a great location and super-nice owner. Heike B and family, Germany, Owners Direct, June 2018. Wonderful setting and stylish property. A very well designed and stylish property set in the middle of Praa Sands with a lovely view out to sea. The large decking area is excellent for sitting in the sun. Julian and family, UK, Owners Direct, April 2018. The house is perfect and the location a dream. The holiday in Praa Sands charmed my partner and I. Our expectations were exceeded. The house offers lots of space, the furnishings are great and the view is terrific. The wonderful terrace and the large garden invite you to linger. We loved the peace and quiet. The house was very clean and the welcome food package was both useful and a lovely gesture. Geraldine's care and communication before and during the holiday was always warm and perfect. We will be back. Franziska and partner, Switzerland, Owners Direct, September 2017. Rainbow's End at Praa Sands is a beautiful house in an excellent location with a lovely garden and so close to the beach. 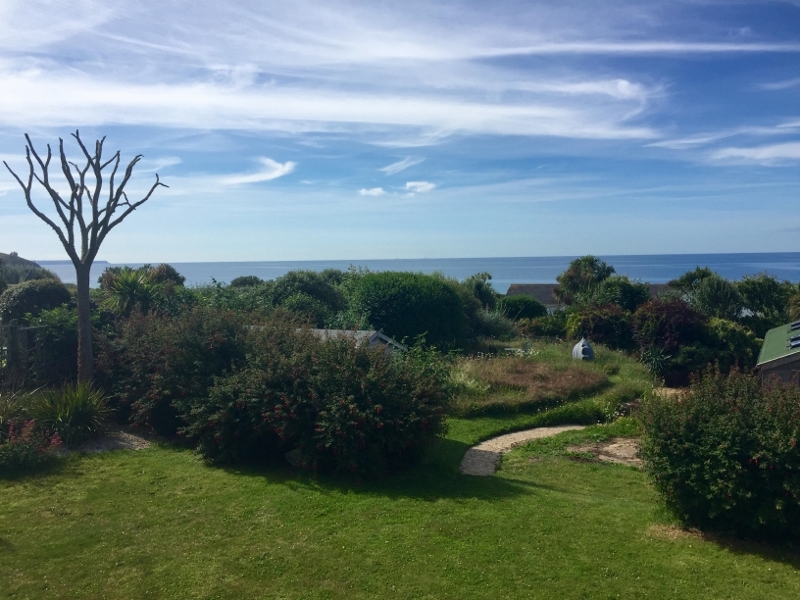 The house is very clean and tidy with excellent cooking facilities, including a barbecue, and lovely views overlooking the sea. We will recommend it to friends and family and hope to use it again ourselves. Elizabeth and family, UK, Airbnb, August 2017. The kitchen was brilliantly stocked, and much appreciated. We loved the house and location and had a wonderful week, thank you! Andy and family, UK, Owners Direct, July 2017. Beautiful house in a fantastic location: We had a lovely week at Rainbow's End. The house left nothing to be desired. Especially the terrace with the great ocean view invites you to linger. A highlight is the very short walk to the beach. The house and its wonderful surroundings is unrestricted recommendable for a family vacation. Christian and family, Wolfsburg, Germany, Owners Direct, July 2017. ​Fantastic location, beautiful house and wonderful view: We had a lovely time at Rainbows End. 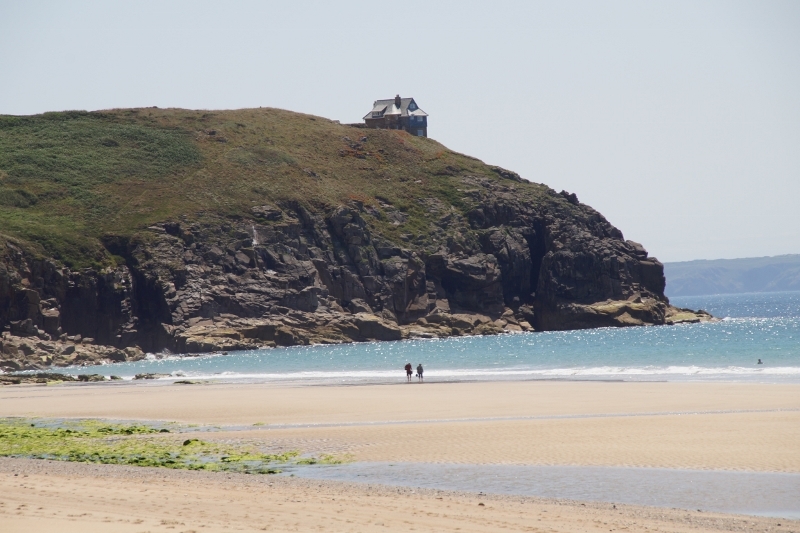 The house is in a perfect location just a short walk to the stunning beach and down a flight of steps. The view from the deck was fantastic. Communication with the owners was very good and they couldn't do enough to help us although there was nothing lacking at the property which was well equipped for self catering and entertainment. We will definitely be returning in the future! Fiona and family, UK, Owners Direct, July 2017. Stylish and comfortable family home away from home: A perfect house for our family reunion (5 adults) in a part of Cornwall that has so much to offer. 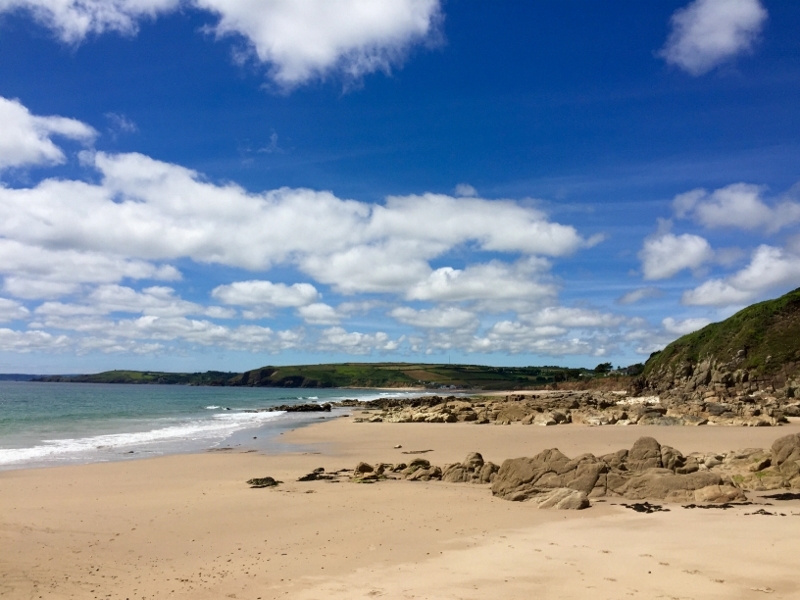 We were two minutes walk from Praa Sands, a beautiful, clean beach with good waves for hours of body boarding after long, scenic walks along the coast path. The house is well equipped and comfortable and we really appreciated the stylish interior. The bi-folding doors open the whole house up to the large garden and sitting on the large deck for meals/evening drinks was probably our favourite activity! We stayed before the main holiday season and it was nice and quiet. 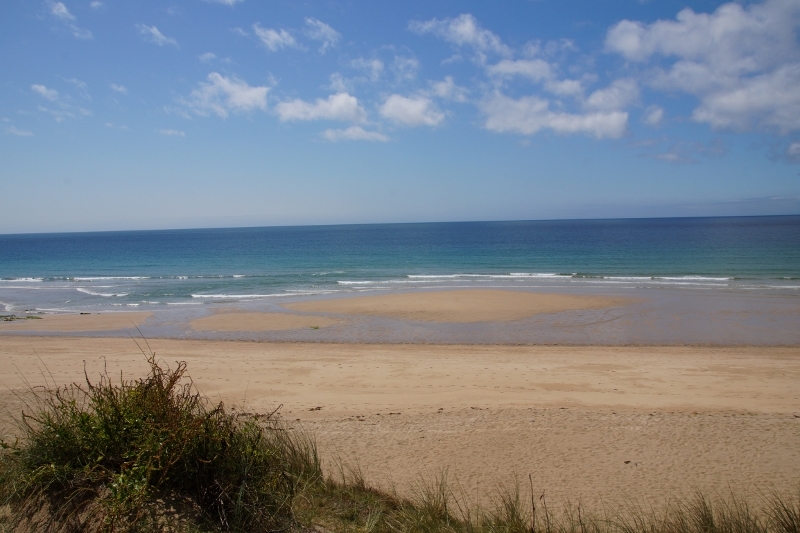 I imagine that Praa sands is a very popular beach in the summer, particularly as there is a RNLI lifeguard presence during the day, but the size and secluded nature of the plot would provide a peaceful retreat from holiday crowds. The two local cafes provided basic food and drinks and it was possible to book lessons in surfing and to hire equipment. We were pleased that we had brought wet suits as this made it possible to stay in the sea for even longer. Geraldine was exceptionally helpful and prompt in responding to inquiries and the Welcome Pack was greatly appreciated. We all agreed, as we watched the sun go down on our last evening sitting on the deck, that we would like to return for two weeks next time. Tess and family, UK, Owners Direct, June 2017. We had a really lovely time in your beautiful, homely house. Everyone loved it. It's in a perfect spot. There was plenty of space for all of us and had everything we could possibly need. Thank you so much for the generous pack of supplies you left for us. They were greatly appreciated. Thank you again. We are so glad we chose your house for our celebrations. Beautiful House, fantastic location and a great host: My wife and I stayed in Rainbows End with our two daughters - aged four and two - and my parents. 3 generations under one roof. The house was perfect for us - big, bright and spacious. It is one of the best equipped holiday rentals we have stayed in. Geraldine has gone to a lot of effort to ensure there is activities for all weather. The location in Praa Sands is great. The beach is beautiful, there are plenty of nice walking tracks to explore with amazing scenery in all directions. There is a nice little pub right on the beach just 5 minute walk away. Very easy with two little ones in tow. 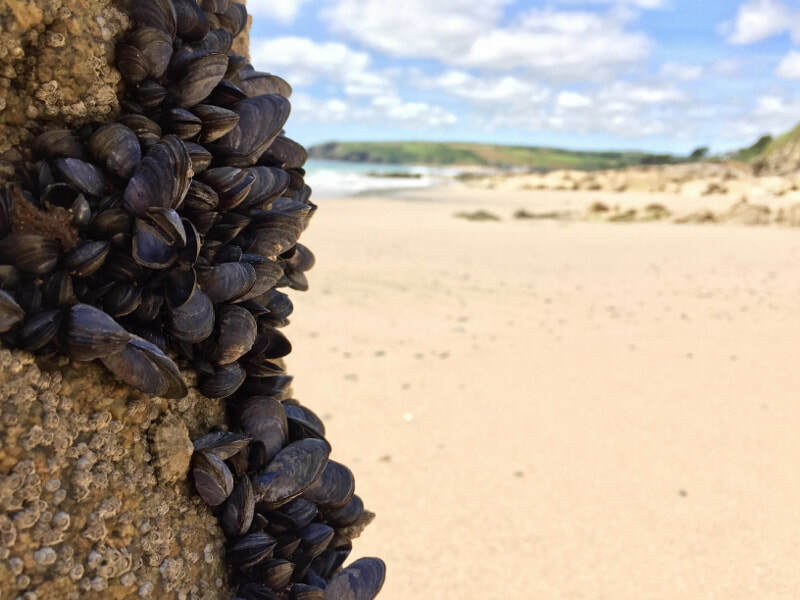 Praa Sands is a really well located base for exploring Cornwall. Despite being mid-term holidays we were able to fairly easily drive from Lands End to St Ives and out to Lizard without many traffic problems. Geraldine is a very responsive host and really helpful whenever we had questions or issues. We hope to be back in Praa Sands in the not too distant future. ​Memories for many generations: My wife's mother came to Toronto, Canada from London in 1957. She wanted to revisit happy childhood memories of the Cornwall area with her daughter and grandson and asked if I could organize the trip for her. From my first email enquiries through telephone conversations, Geraldine was super friendly, courteous and informative. The house was perfectly suited to their needs and ideally situated for their day trips from one end of Cornwall to the other. She so fell in love with the home she had cousins from London visit for a few days. Everyone loved it. Pete and family, Canada, Owners Direct, May 2017. It does not get any better! We absolutely recommend: I have booked many apartments and houses and have never experienced such facilities and hearty care. When you arrive there is a welcome package with everything needed for the start of your holiday - eggs, milk, butter, cereals, bread, coffee, tea ..... The house is like a private house exchange: From an incredible spice selection, books, CDs, DVDs and games for rainy days, kitchen equipment with baking, picnic accessories, measuring cups .... there is everything! The beds are very comfortable and the layout was perfect for us. The distance to the beach is short, the view wonderful and the tips and descriptions by Geraldine totally comprehensive. We spent wonderful hours on the terrace. I would also like to emphasize the suitability for families with small children, since there are child gates on the stairs and lots of toys and a playroom. We would loved to have extended our stay. Annette and family, Germany, Owners Direct, April 2017. Great House in Fantastic Location! We (my husband and I and 2 children) stayed at Rainbow's End for 1 week and loved it. The house is really lovely, very comfortable and well-equipped. Our 4 year old and 2 year old loved it too. There is a great garden with a hammock, and the house is 5 mins walk from a beautiful beach. We wish we could have stayed longer! Geraldine, the owner, is extremely accommodating and couldn't have been more helpful. If you want a relaxing holiday in a great location, this is the place for you. Alison and family, Owners Direct, April 2017. 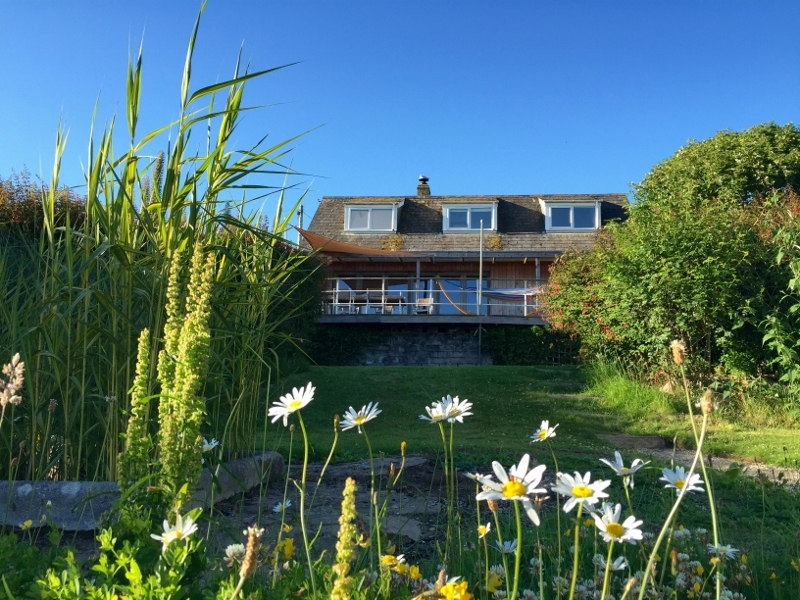 A gorgeous, unique, comfortable property with incredible sea views: Myself, partner, two children and parents stayed at Rainbows End during February half-term and we had a great time! The house was extremely well equipped and had everything we needed from bottle openers to bath towels. On arrival we were greeted with a lovely welcome pack which was very thoughtful and gratefully received. Geraldine answered any questions immediately and was extremely helpful. Unlike other holiday homes we've stayed in Rainbows End retains a homely feel. The space inside is also perfect for a large family - or two separate groups - due to the upstairs and downstairs bedrooms and bathrooms. The sea views from Rainbows End are amazing and I don't think I would ever tire of them! This truly is a special house in a brilliant location for exploring with fantastic decking and gardens that is perfect for families and friends. We cannot wait to return! Katie, Will and family, Owners Direct, February 2017. ​We had a lovely week at Rainbow's End. We were staying with our 4 year old and 20 month old as well as my husband's parents and there was plenty of space for everyone and the house was kid friendly. The photos don't do justice to how nice the upstairs playroom/living space / bedroom is, or how nice the eating area is by the kitchen. The house was well equipped, with everything we needed plus Sonos speakers, a few toys for the kids, highchair and travel cot, and a hot tap outside for showering off sandy feet. The easy access to the beach at Praa Sands was great and the house was a perfect base for visiting Cornwall. .
​Melissa and family, Airbnb, October 2016. A wonderful holiday! This is a lovely spacious house in a great beach location with an unbeatable view of the sea before. The house was tailor made for our family (two adults, three schoolchildren). The decor is tasteful and complete and everything functions perfectly. Everything was super clean and well maintained. The fireplace gives a special atmosphere. The large veranda and the garden are an oasis. From the porch we watched dolphins playing in the sea. Our hosts were perfect and amiable. All information was given before arrival and we could have contacted them at any time during the stay, but there was no reason for everything was as described. Geraldine prepared a helpful list of places to visit, shopping and restaurants and nearby pubs. We arrived late on our arrival date and found a "starter package" with dinner and breakfast. Thank you - it was great! We felt very comfortable. A house in which you are at home right away. Martin and family, Berlin, Owners Direct, October 2016. First Class. Beautiful house in great location. Hans and partner, Germany, Owners Direct, September 2016. We had the most wonderful holiday at Geraldine's place. The house is very spacious and extremely well equipped. With a stunning view and a huge garden not to mention the garden studio where we could do yoga without the kids jumping on us. The location is superb. With just a few minutes to the beach and a short car journey to the most magical places like St Michael's Mount, the Seal Sanctuary and the Eden Project. We were very well looked after by Geraldine and are very keen to come back. Lotta, friends and family, London, Airbnb, August 2016. From the moment we stepped through the door we felt at home in your wonderful house by the sea. We swam in the sea, flew a kite, made use of your games collection and enjoyed meals around the dining table. We were also able to spend time apart, whilst still being together. The house is beautiful, I felt like I was staying in an art gallery. But also very practical with everything a family needs for a perfect getaway. Kerry, Mike and family, Southampton, Owners Direct, August 2016. What a wonderful place to stay. The best home we have stayed in a Praa Sands in over 6 years and we will definitely be back! Thank you for everything. Caroline, Peter and family. Hertfordshire. Owners Direct. August 2016. Amazing....sitting on the terrace and just enjoying the view. After an great day at the coast or in a lovely town we loved to relax back at the house. You don't need more to send a great holiday........it's a dream. Thank you for letting us spend a week in your wonderful house! It was just great and we would love to come back. ​Veronika and family. Switzerland. Airbnb. August 2016. ﻿Thank you for a wonderful 10 days spent in your house. It was like a paradise for us. Also, the kids enjoyed it very much. We hope to come back as soon as possible. Ingo, Jenni, Bruni and Niko, Germany. Owners Direct. July 2016. Rainbows End is a fabulous house which more than caters for all ages. The house has a wonderful design which creatively mixes old with new, art and artefacts throughout, a journey through time. Different textures, levels & sculptures throughout the house & garden are enhanced by a wonderful variation of both native & subtropical plant varieties. The large deck area above the garden gives uninterrupted views towards the sea,beach & headlands. Brilliant location, with a fantastic beach & walks literally at the bottom of the garden. A great base for visiting Cornwall with all main attractions within easy reach. A truly unique family home,which will more than cater for you holiday needs. You WILL Relax. Steve & Karen. July 2016. Rainbow's End made my family holiday great! A really nice place. We love the house decoration. The house guide is very helpful. The views are beautiful, and it's easy to walk to the beach! Highly recommend! Chunxin and family, London. Airbnb. July 2016. We have had a wonderful week in Cornwall!! The house gave us a great base for all of the places we wanted to visit and the perfect place to relax at the end of a busy day. We had everything we needed and much more, as well as the stunning views. Can't wait to return. ​Trev, Gill, Jim and Carolyn. Owners Direct. June 2016. We really did find a pot of gold at Rainbows End. According to our children, this was the best holiday ever and they are extremely keen to return very soon. What we all love about the location is the close proximity to a beautiful, sandy beach (which has two great places to eat) and the fantastic sea view. The house is elegantly stylish and equipped with everything you need. The living room opens up onto a large decked veranda where we ate most evenings and enjoyed quiet time with the children as we wound down from busy days visiting the many attractions along this coastline. Penzance is extremely close by, but we bought all fresh food from the fantastic local farm shop a few minutes drive away. Lots of information regarding anything you could possibly need is laid out in the house folder. Geraldine was on hand to help answer any questions. We can't recommend Rainbows End enough. It's a very peaceful place to stay - a real find and we hope to return to soon. We all had a wonderful stay, a real gem. Geraldine was extremely quick in responding and gave us everything we needed (great places to eat, a gorgeous living space) . It was a peaceful and restful stay that I'd highly recommend. The house was in a great location to the beach and if you like water sports like us it is perfect. We will definitely return again. ​Natalie, friends and family. Airbnb. June 2016. Does one need more to be happy than a beautiful house like Rainbows End in a stunning landscape as we found it here! A perfect blue sky during the day, a sparkling sky in the night. Everything was wonderful. ​J & D, Berlin. Autumn 2015. Thank you for a lovely holiday in this heavenly house. Favourite things - sitting for hours on the sofa looking at the sea, hammock lazing on the deck, early morning swims, sheltered Sun lounging on the lawn, sea kayaking around the headland, peaceful long sleeps in the quiet night, baths with a view, cooking in the well equipped spacious kitchen, the mid century style and attention to detail, art and sculptures, the incredible light pouring into the house, the smell as we walk in the front door - of sea and peace. ​Josie & Al, Bristol. Summer 2015. 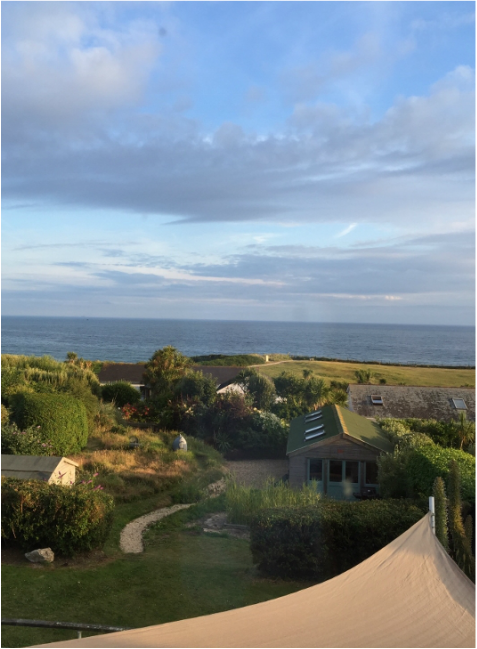 A wonderful week spent in Cornwall made even more special by staying at Rainbow's End. Amazing views, light spacious rooms with a unique style has led to a calm and relaxing week. ​The Wades, London. Summer 2015. Guest photos by Jenni, Ingo and family, 2016.